It’s hard to imagine Albuquerque is so close; the B&B is only 30 miles to the west of the city off I-40, which makes the quietude and big-sky surroundings of Apache Canyon Ranch both more accessible and precious. The nearest structure is a former Navajo trading post half a mile up the road. Many guests of the B&B are also drawn to its proximity to Native lands, and by innkeeper Ava Marie Bowers’ knowledge of them. When I arrive, I’m still dusty from the trails, but Bowers welcomes me all the same. The main house features works beyond the usual B&B bric-a-brac—there are photographs by Lee Marmon, whose career in movie-star portraiture stemmed from his skillfully composed photos of the elders on his pueblo, intricate santos and katsinas, and Navajo rugs so exquisite I wonder why they’re on the floor. Every piece has a story, and Bowers enjoys telling them. A Georgia native and 40-year resident of New Mexico, she combines the best qualities of both regions. You can hear it in her dinner conversation, heartfelt recollections from the South mixed with witty observations of neighboring tribes, like a mash-up of Alice Walker and Tony Hillerman. It’s also evident in the meals she prepares. Her rack of lamb with green-chile salsa could be described as a sophisticated blend of diverse cuisines, but I’d just call it good home cooking. 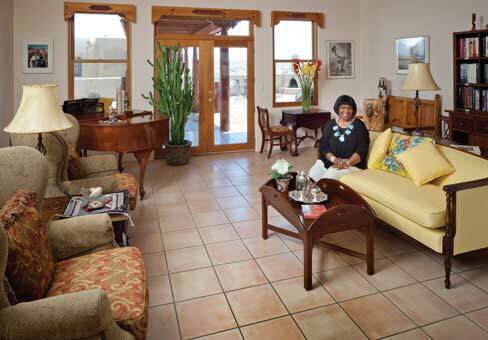 Bowers puts me up in the Casa Kokopelli, a detached cottage with a jetted tub and views that extend nearly 40 miles to the Sandía Mountains in the east. I appreciate the time alone on the cottage’s porch, reclining for an eyeful of stars. After a cozy night in soft linens on a four-poster bed, breakfast is better than I dreamed. Never drizzled agave syrup on your cheese grits? You’re in for a treat. Oh, and the buttermilk pie is a slice of heaven. I take my coffee out on the patio, and watch the 700-foot sandstone walls of Mesa Gigante glow in morning sunlight.